...an old mower took pity on him, and altered his scythe, by hanging it wider and flatter for mowing; whereas, before, he had hung it so that the edge cut too low, and the scythe hung too narrow, which obliged him to strike three strokes to the company's two, to keep up with them. But after this alteration, he mowed as well as the best of them. 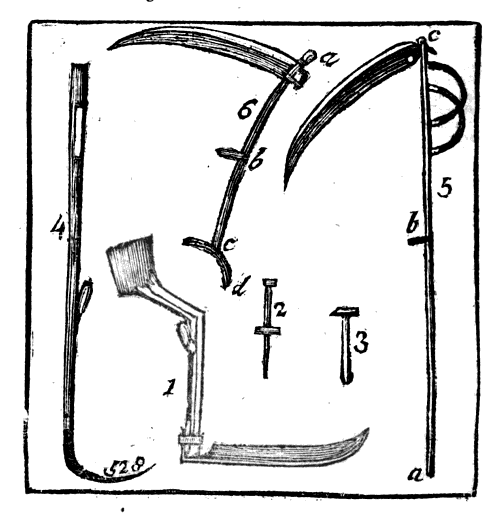 Below are instructions for using an American scythe, quoted from articles written in the 1800s. Emphasis has been added (in bold type) to some portions that are similar to present-day instructions for Continental European scythes. 1. To stand erect and walk up as near to the standing grass as you can and still have room to cut it all off with the heel of the scythe. 2. Keep the scythe as flat on the ground as possible from heel to point. 3. Point in low, and point out low, and let the scythe swing back and forth on a horizontal line, and avoid raising the heel a foot high when pointing in; and be careful to keep the point down close to the ground when pointing out. Avoid a scooping motion, by which the stubble is left high where the scythe sets in and comes out, and low in the middle of the swath. Where the surface of the ground is even tolerably smooth it will be difficult to determine which way the swaths were made if they have been well mowed. 4. 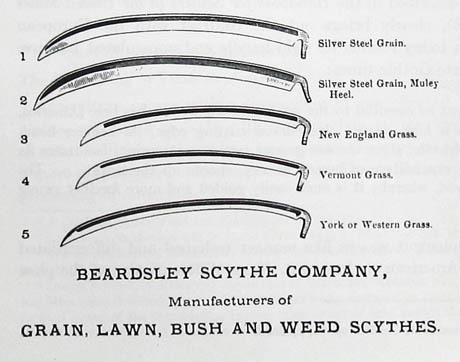 Every beginner should he taught to make every clip with scythe with a drawing cut, by sliding the edge of the scythe along the grass, instead of handling it in such a way as to cut the grass with a crushing stroke -- straight across the grass. This is one of the most important considerations in handling a scythe of any kind. The scythe should be handled in such a manner as to cut all its length from heel to point. 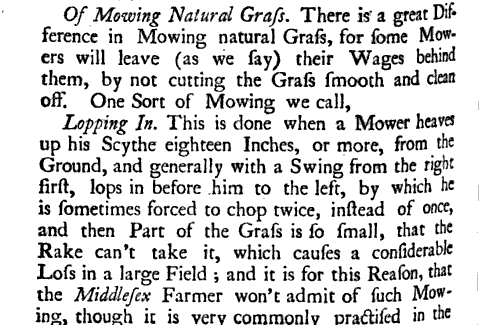 When the clips are made in such a manner as to cut square across the grass much more strength will be required to mow, and the grass will not be cut as well as it will be to cut with a drawing stroke. 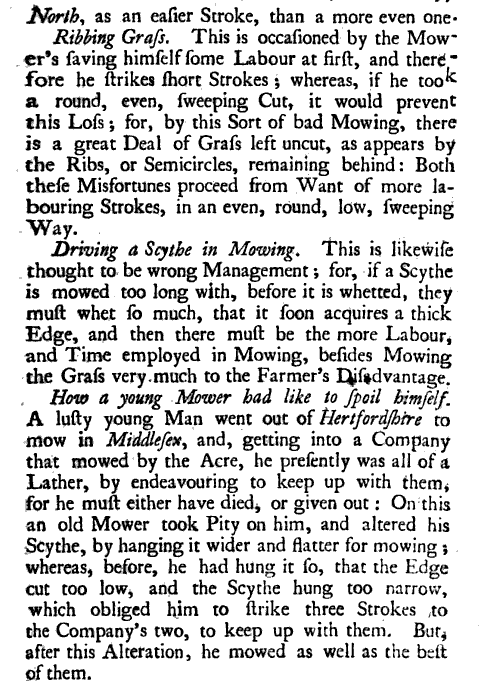 The correct motion of a scythe when cutting grass may be illustrated in this way: Take a piece of chalk in one hand and bend forward to the floor and describe a half circle on the floor. Now move forward six inches at a step and make a half circle at every step. These areas will represent the clips made by the scythe in mowing, and the motion of the hand when describing the circles will furnish a correct idea of the proper motion of the scythe. A man cannot mow easily nor mow well unless his scythe is in good order and properly hung. 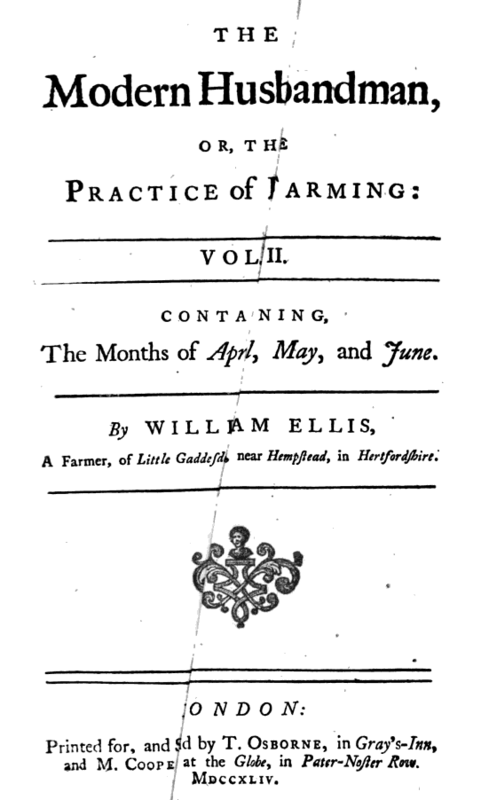 Every farmer should have a copy of the Young Farmer's Manual and learn how to grind and whet his scythes correctly. The first thing in hanging a scythe correctly is to put the nibs or tholes in the right place on the snath. The right hand nib should be fixed at the highest point in the bow of the snath, and the left hand nib should be about one foot from the other. For boys, 10 inches will be about the correct distance. Now fasten on the scythe [blade], and if the bow of the snath inclines too much forward towards the scythe, it must be adjusted by shaving the snath at the heel until the bow of the snath will stand just right when the scythe and snath are lying on the ground. The nibs should not stand too far forward, nor too far back or too erect. If the left nib stands too far forward, a mower will not be likely to point out good when mowing, and if it stands too far back he will not point in well. Let the nibs be adjusted until they stand just right. The edge of the scythe should stand so that a straight line from the snath between the nibs will just touch the cutting edge and the back of the scythe on the wider side. A man will mow much easier when the edge stands on a line with the snath between the nibs, than he will if it hangs either above or below that point. And another thing is if the edge hangs too low, a scythe is very much more liable to be dulled than if it stood higher. If the edge hangs too low when the grass is heavy, much more strength will be required to mow. We have seen some very stout hardy men toil and sweat all day and do but a small day's work, while other men of much less strength would cut more grass and yet not exert themselves to fatigue. From this it is evident that some mowers exert twice the strength that others do in performing the same work, and those who use the least strength usually do their work the best, though they may not render the field so smooth by cutting off the tops of knolls, stumps, stones and other impediments that intrude themselves among the thick grass. Some men keep their scythes in prime order, and in mowing they lay their strength out to the best advantage; they use a gentle motion that will not fatigue; they are less liable to strike stones, etc. than those who make greater exertions, and when they do strike them less injury is done. A scythe should hang light and easy, so that in mowing no exertions will be necessary excepting to swing the scythe and hold it steady. 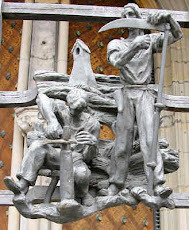 We have seen some scythes and sneads, or things that had these names, so rigged that the strength of one man was necessary to hold them in a proper position, while that of another was needed to swing them; of course, by having a good scythe well hung, one half of the labor will be saved. Update: More American Scythe Instructions can be found here.